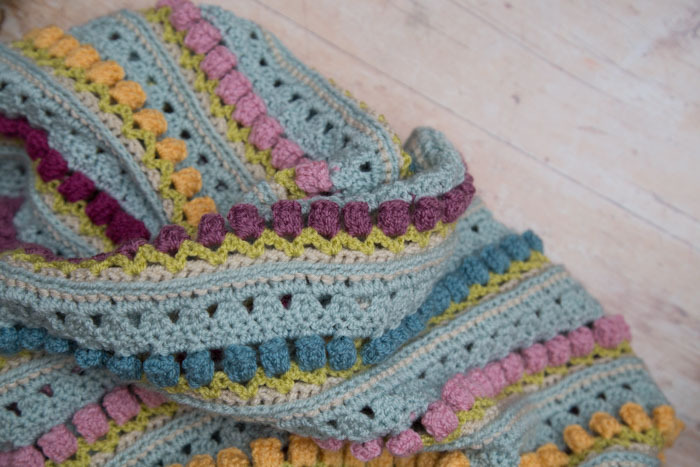 I am very pleased to tell you that my new blanket now has a name: Memory Lane! Thank you for your positive response to my previous post and for all your wonderful suggestions. I could see, from your comments, that we were all thinking more or less the same thing – each of us reliving our own memories and stories. 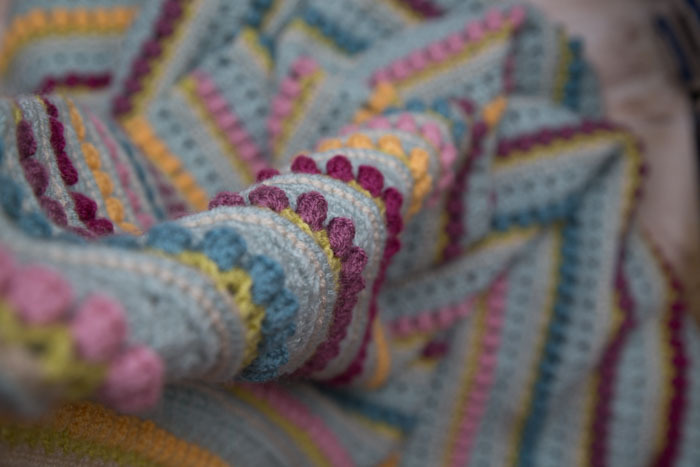 Last week’s post was a very rambling one about the journey the colourway for this blanket took me on. The more I wrote, the more I realized that I simply couldn’t name this blanket after one specific thing or place. It was all of my memories rolled into one! I actually thought that I would call it I See Memories because the feeling of nostalgia and remembrance was so strong. I was 95% sure that that would be the name, but I put out a call for suggestions, just in case someone came up with a name that made me think: YES! My favourite online suggestion, made by Pia Thadani from StitchesNScraps, was Lifetime in Colour. I thought that it was much more poignant than I See Memories. And then Kay (who made this sample for me) and Jo (so loveable, you just want to eat her with a spoon) came to tea on Wednesday. 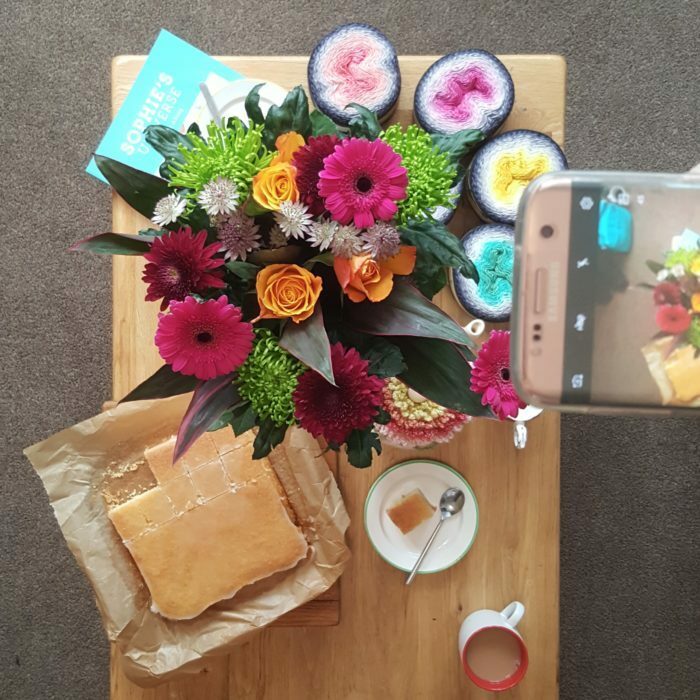 Jo Taking a Photo of My Wedding Anniversary Bouquet, My Stash of Scheepjes Whirl, Kay’s Lemon Drizzle Cake, and the Sophie’s Universe Book. Jo suggested ‘Memory Lane’ and my heart leapt in my chest, but I didn’t want to let on that it was exactly right, so I acted all nonchalant and told her that it wasn’t really speaking to me. I know! Bad friend!! But just imagine her face when she reads this and realizes that she is now also part of my journey down memory lane! I happen to know that Jo fell in love with this blanket as soon as she saw Kay working on it, which makes me even happier about her part in choosing the name. The colours are subdued and reminiscent of summer twilight in an English garden. Equally, they are reminiscent of my youth, which was filled with succulents and South African sunsets. The stitch repeat is simple and floral, creating an unhurried, relaxing fabric. 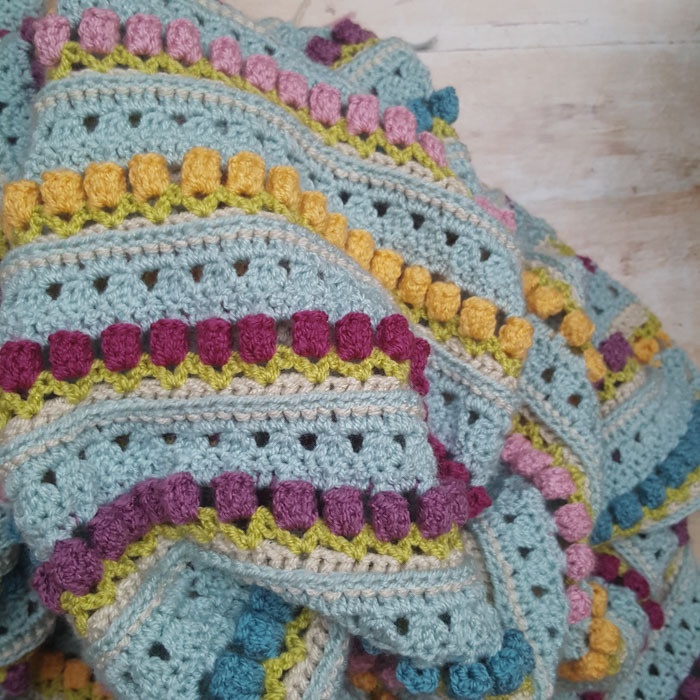 I can’t wait to show you the finished blanket next week! Absolutely love it. Need the pattern! Your designs are so beautiful. I have made “Sophies Universe” for two times. It was a wunderful experience. Dedri, will Wool Warehouse be selling a kit for this CAL? Nancy (Lady Bonneville), I missed your comment, sorry. I am sure you did give her extra cake. How are you? Still 2 weeks for the pattern! I cant wait. Love to see the progress. I cant wait to see the finished blanket.